Short and sweet today…I have one of those family gatherings and have no idea when I will be back home tonight. 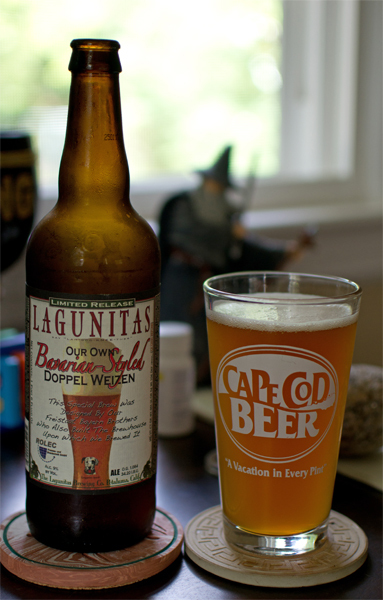 Beer #301 is Bavarian Styled Doppel Weizen by Lagunitas Brewing Company brewed in Petaluma, California. This Weizenbock has an ABV of 9%. It had a lovely color to it, a pale orange and was quite cloudy. Just a tiny white head sat atop it. The nose was light with cloves, wheat, and Bazooka bubblegum. That bubblegum flavor was up front in the taste. The wheat mixed nicely with the spiciness of the cloves. The alcohol was apparent here in the taste also…not overwhelming but it was noticeable. This was fairly bitter and had a nice spicy aftertaste along with banana. The body was somewhere between medium and heavy with almost a sticky, syrupy consistency. Not overly carbonated…it was just right for this brew. The alcohol makes itself even more known as it warms up. After a one and a half hour commute, I was looking forward to beer #299, Weihenstephaner Vitus by Bayerische Staatsbrauerei Weihenstephan. It almost didn’t happen. As I opened the bottle, it was like someone shook the bottle up, the beer came rushing out like lava forcefully ejected from a volcano and on to my floor. I quickly picked up the bottle and was able to save about 3/4 of a tulip glass worth. Can this night get any better? I sure hope so. What I was able to save was a beautiful cloudy golden amber color. The fluffy white head was massive. Excellent nose this one had, cloves and banana along with a nice toasted malty bread and pepper aroma. There was even a touch of hops in the form of a citrus aroma. The taste didn’t disappoint, the hops came through with an orange like flavor. It had a nice spice taste with black pepper and cloves. It was nice and malty with a bit of caramel and bread…think toast. I didn’t get the banana I picked up on the nose in the taste though. Near the back end was a nice smoky burnt flavor. The body was medium, it was nicely carbonated, and it was quite smooth and creamy. This was highly drinkable. This was a fantastic beer. It had such a nice flavor with everything working together, I guess you could say in harmony and nothing being overpowering. I have had three beers from Bayerische Staatsbrauerei Weihenstephan and each has been world class. Do yourself a favor and try them if you see them. I guarantee you won’t be disappointed. 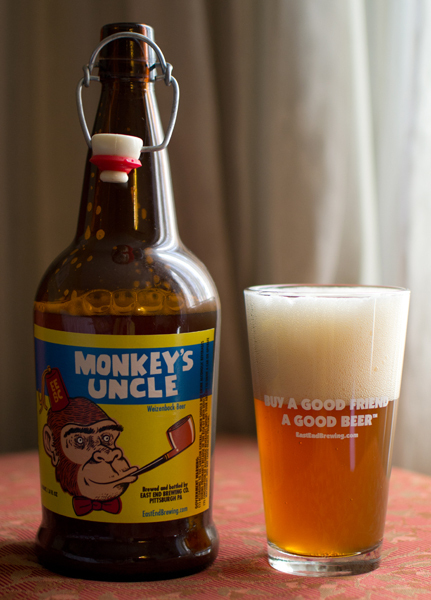 Back to the East End we go for beer #293, Monkey’s Uncle By East End Brewing Company. This beer is brewed in the style of a Weizenbock with a hefty ABV of 10.10%. Into my East End Brewing Company pint glass (love the saying on here…buy a good friend a good beer) went Monkey’s Uncle. It had a huge off-white head. It didn’t last long though. It had a cloudy amber orange color. The nose was yeasty…with a huge aroma of cloves and banana. Add to that a bit of toasted caramel malts and spices (maybe coriander)…and it was quite pleasing to smell. Man…this was super spicy…cloves and coriander…maybe even a bit of black pepper made up a good portion of the flavor. A banana like flavor was also present but the spice kind of drowned it out just a bit. It was kind of sweet but not overly so. It finished a bit dry and had a nice bitter bite to it. It had a nice medium body with quite a lot of carbonation. The alcohol was hidden really well. I liked this one from East End more than yesterdays, Bigger Hop. This was very drinkable for me even with the high ABV. Good stuff from Pittsburgh. And it just a few more hours I will have the chance to taste even more beers from East End…I can’t wait. Oh yeah…if you are ever in Pittsburgh, and want good beer…seek out East End Brewing Company…from what I have had so far, you won’t be disappointed. 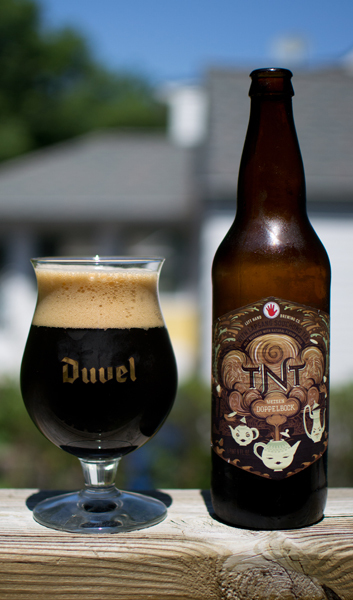 Beer #244 is TNT by Left Hand Brewing Company from Longmont, Colorado. This Weizenbock is brewed with lapsang souchong tea with an ABV of 7.9%. Lapsang souchong tea is Chinese tea where the leaves are smoked over a pinewood fires. Sounds interesting to me, but I like smoky things. The color of this brew was a very deep, dark brown. The head was awesome, huge, fluffy, and light brown. The nose was smoky and burnt smelling. Those qualities really took over the aroma in a way that I couldn’t get anything else out of it. The taste was heavy on the roasted malts with flavors like chocolate and nuts. There is a sweetness here also, quite like dark fruits. 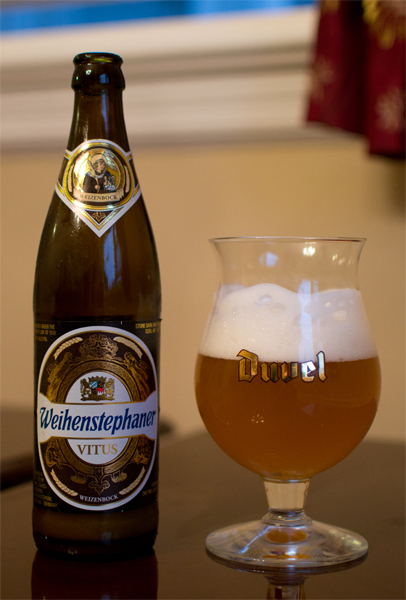 The smokiness is present in the flavor throughout but not like a Rauchbier, which to me has flavors like smoked meats. The smoky flavor here is what I think charred wood would taste like if I ever had actually tasted it. The aftertaste was dominated by those smoky flavors. The carbonation was quite low in this medium bodied brew giving it a creamy feeling. The alcohol was hidden very nicely here but that sweetness, almost sickening at times, made it a slower drinking brew for me. This was a nice beer and I was digging the smoky quality the lapsang souchong tea provided. Try if you like smoky stuff…stay away if you hate smoky stuff. It is as simple as that. Roll me over…in the clover…roll me over, lay me down and do it again. Ahh such a classic song. A classic you say? It sure is if you have ever been to Rosie Rumpe’s Regal Dumpe Dinner Theatre in Williamsburg, Virginia. I don’t believe it is open anymore and that is a shame. It was one of the funniest dinner theatres I have ever been too. So in honor, I will pour beer #202, Slam Dunkel by Weyerbacher Brewing Company from Easton, Pennsylvania, into my Rosie Rumpe’s mug. This Weizenbock (ABV of 7%) was dark reddish brown with an awesome off-white head. It had a nice nose of caramel malts, bread, and there was a spicy component I couldn’t quite put my finger on. It tasted just like it smelled…sweet, malty caramel but also had a…and I thought this was a bit odd…banana flavor. It was quite yummy. Medium bodied with lower carbonation made this quite creamy. This was a nice brew that I found easy to drink. I guess you could say this Slam Dunkel was a slam dunk. Drink up! I figured I would have a beer from Germany tonight to toast a friend who has gone on to hopefully bigger and better thing career-wise. You know who you are…you have proof-read my blog numerous times and for that I’m quite thankful. Cheers to you! Good luck in your new job! Beer #150 is Der Weisse Bock by Mahrs Brau. 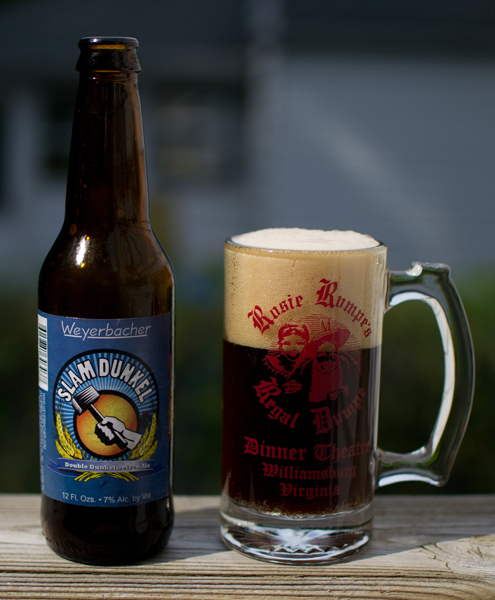 This Weizenbock is brewed in Germany and has an ABV of 7.2%. 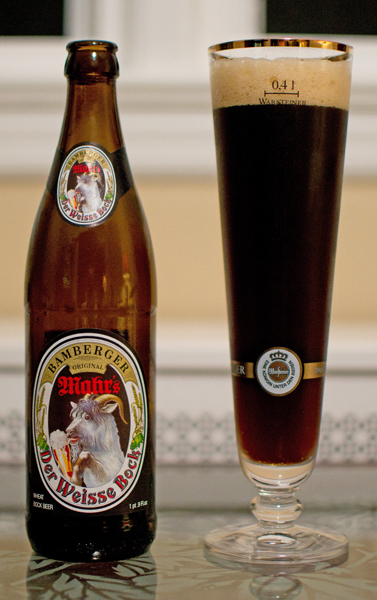 A Weizenbock is a strong German beer or bock brewed with wheat. I love Pilsner glasses, so into one went this brew. I know…it probably isn’t the correct glass…oh well…at least it went into a glass and not a plastic cup. The color was a dark brown with a decent tan head. I got a bit of sweet cherry in the nose along with dark roasted slightly burnt malts. The cherry was a bit odd for me but I was kind of digging it. It was quite tasty with some dark fruit flavors…it reminded me of raisins…but not quite. Sweet molasses and wheat flavors rounded this out. It finished off very smooth. It had a medium body and some lively carbonation. The alcohol was hidden really well. This is my first Weizenbock and I thought this was a pretty good beer. Plus I loved the label on this…a ram licking a glass of beer. Not too shabby.